This is the traditional one piece "bubbler" air lock. 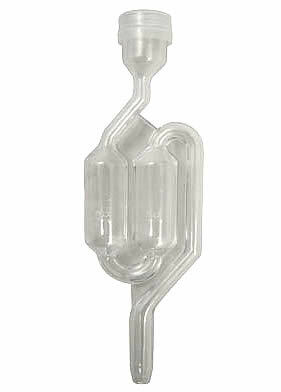 Attach to carboys and fermentors to prevent oxidation and spoilage of wine and beer. Acts as a valve which allows carbon dioxide gas to escape while keeping air out. This 3 piece air lock comes apart for easy cleaning. Air Locks are usually coupled with the correct size rubber bung for your fermenting vessel. Please see our chart for available sizes. Solid rubber stopper fits glass carboys.